The sun is warm and bright and I feel like a new person, emerging from a cocoon of winter jackets and subdued moods. Summer is nearly upon me, with only a week left of school until break. As a gift to myself, I am taking the summer off from work to travel, to breathe, to spend time in the kitchen, to remember what it feels like to have free time once again. Last year, I struggled through my summer, trying to juggle six graduate school courses in an effort to finish my master's degree and dealing with a six week long recovery from an operation that knocked me to the ground. I hope that this year my summer will be different—curative to both mind and spirit. After a long bike ride through the woods and by the lake, my skin is warm and pink from the sun. 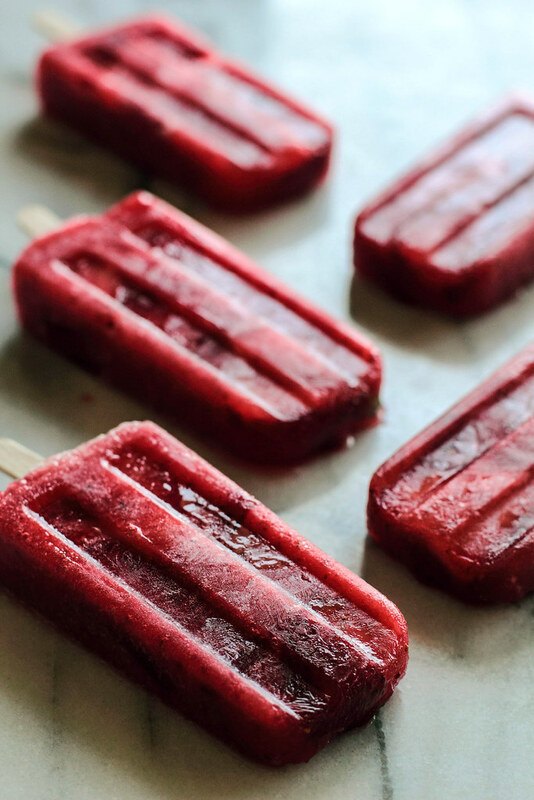 Once I found my way back home, I collapsed on the couch, overcome by heat, and reached for one of these popsicles. It was the right choice for the right time, refreshing and sweet. I have been on a berry kick lately, mixing blueberries, blackberries, or raspberries into my morning bowl of breakfast quinoa. After dinner, I often bring out the berries again, dipping them into melted chocolate (a vice that I find too heavenly to give up). 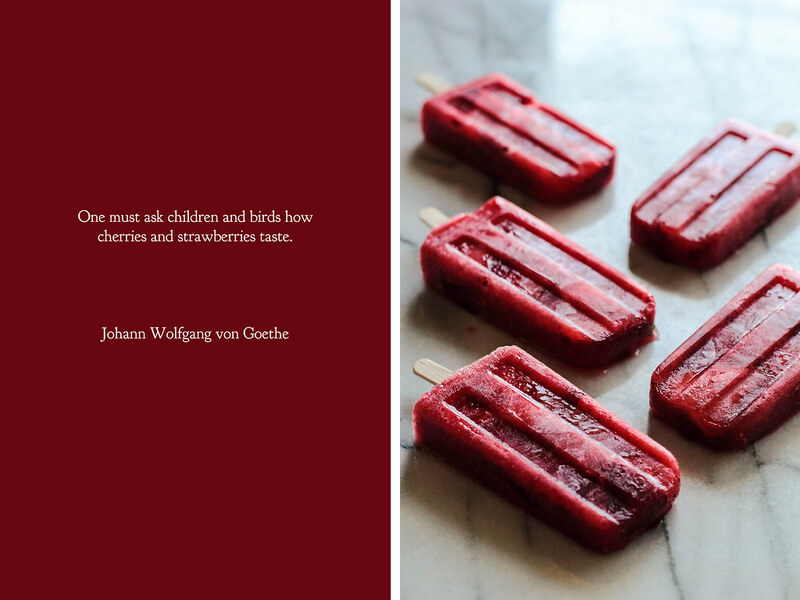 When I was coming up with this popsicle recipe, it only seemed natural to reach for the berries once more. 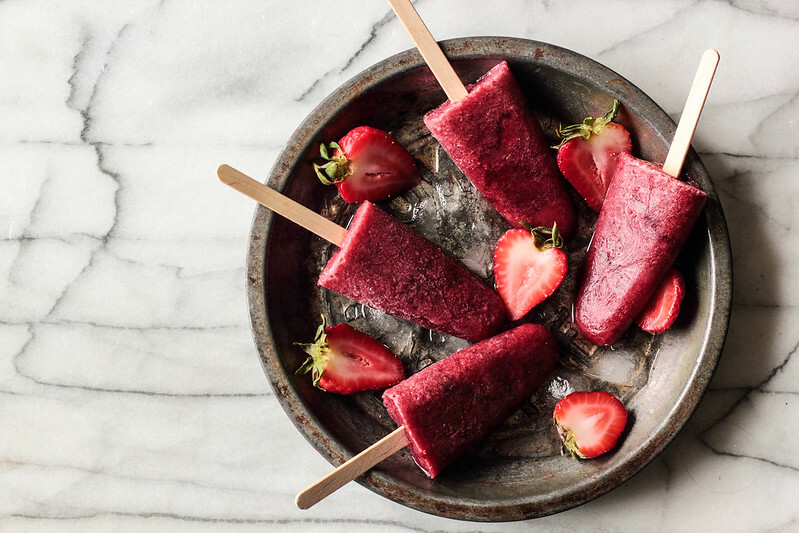 Mixed with a little red wine, these popsicles are as sweet as they are energizing. 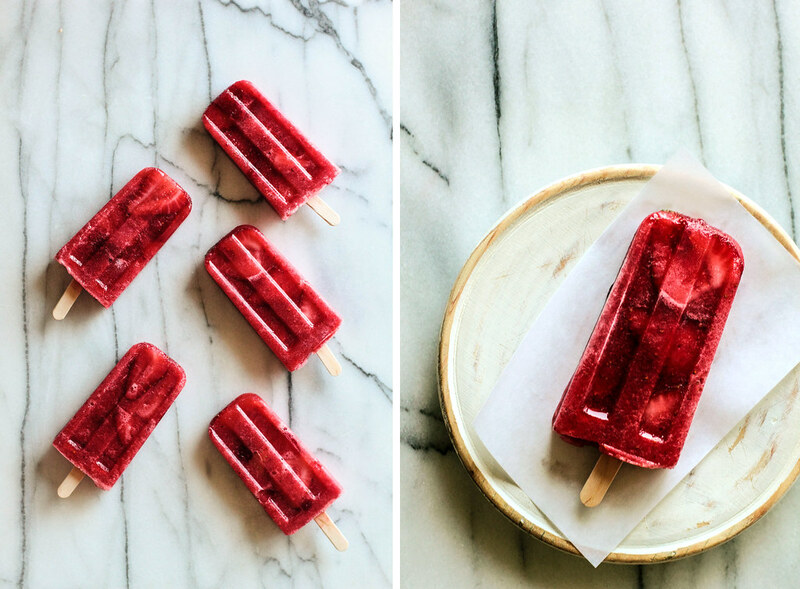 Roasted Strawberry Red Wine Popsicles are a sweet, bright addition to your warm summer evenings. 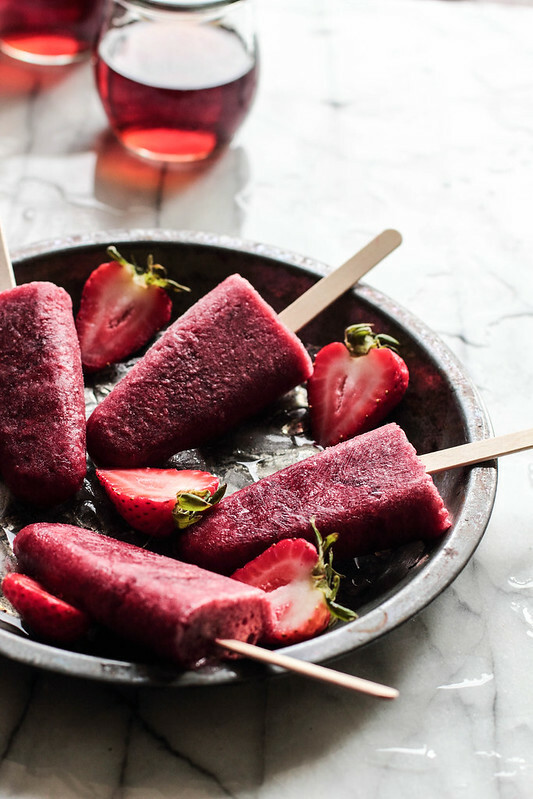 Strawberries are roasted in sugar and balsamic vinegar (to bring out the flavor of the berries) before mixing with sweet red wine to form these frozen treats. 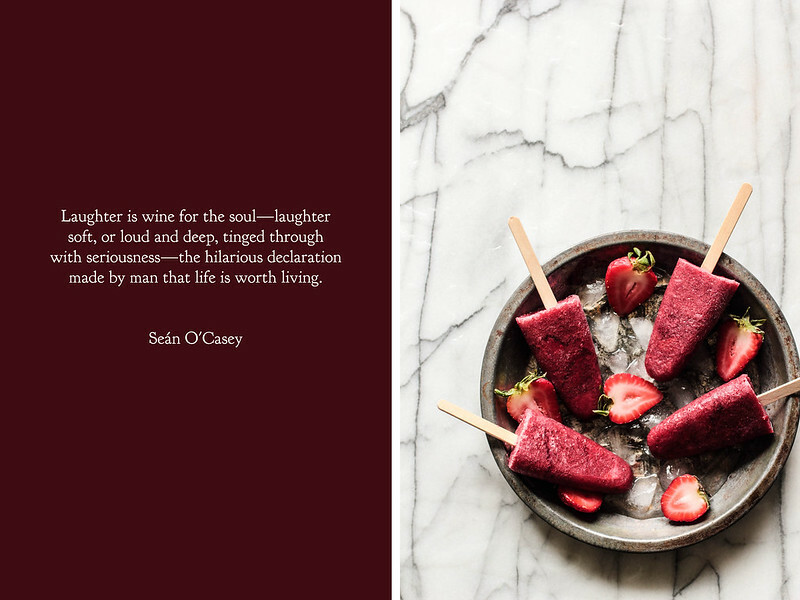 Since the red wine is a major component of the base of these popsicles, it is important to choose a wine that you already love and enjoy. 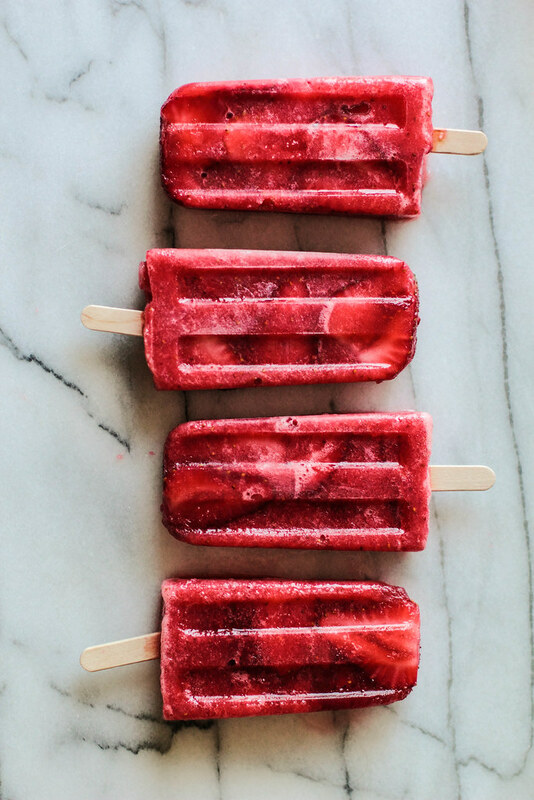 Because of the alcoholic nature of these popsicles, they are not suitable for minors. This weekend brought about a furious blizzard, with flakes falling wildly from the heavens and a fierce wind blowing snow into drifts tall enough to bury cars beneath walls of snow. I spent Sunday with a cup of hot tea between my palms, watching Mother Nature roar outside my window. There is a peacefulness in being in the warmth of indoors, safe and snug, while the elements play outside, just out of reach. The world outside quietly shuts down and responsibilities are forgotten as the front door stays closed. I think sometimes we all need a snow day. Even though it goes against all reason, on the coldest days of the year I crave frozen treats. Throughout the winter season, it seems there is only so much tea that can be sipped and soup that can be ladled. In order to satisfy my cravings for something cool, I often beg family or friends to accompany me to the nearest frozen yogurt shop. Bundled up in winter jackets, scarves, and over-sized mittens, we trudge through the frosted doors and eat until our insides turn delightfully cold. When the cold ice cream finally brings about a case of the goosebumps, we wrap ourselves back up and head out into the winter air. Though this small tradition may seem misunderstood, there is something restorative about spending time in an empty yogurt shop on a chilled February evening. After the blizzard struck (and the obligatory mug of hot tea had been consumed), I found my taste for cold treats begin to seep into my bones. With no choice but to stay in the warmth and safety of the indoors, I decided to create my own winter delight with the food already in my kitchen. A few minutes on the stove is all it takes to whip up a quick cocoa. After I waited for it to cool down, I married it with mini marshmallows and chocolate chips in a popsicle mold to produce a frozen treat that closely mimics its namesake. 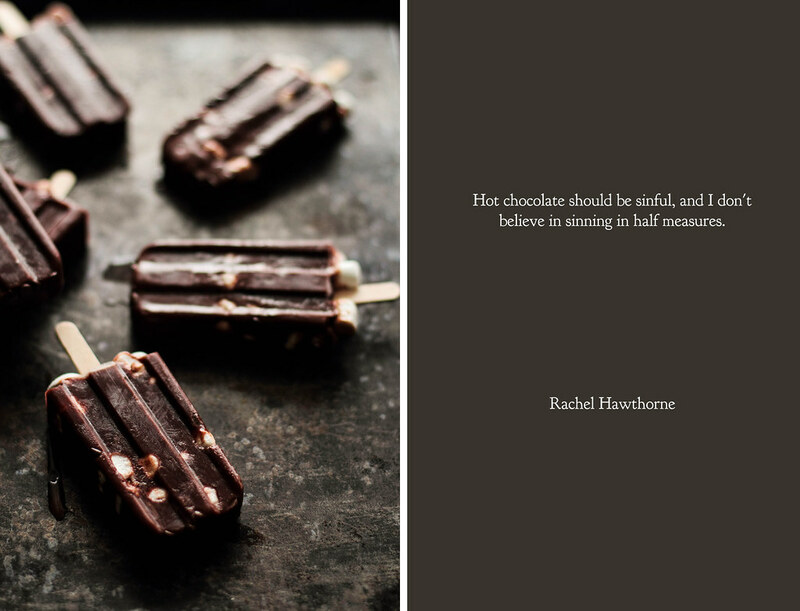 While hot cocoa is a winter favorite, I have found that "cold" cocoa can be just as gratifying. 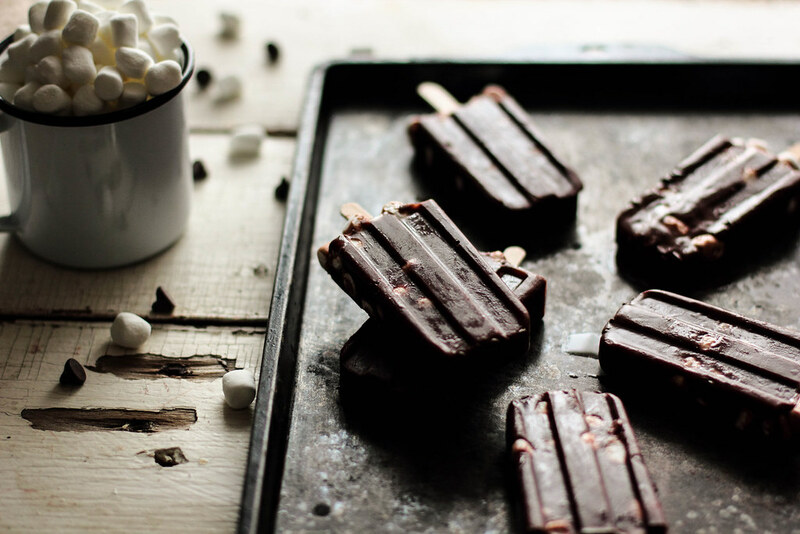 Hot Cocoa Popsicles combine the flavors of the beloved winter drink and turn it into a treat that can be enjoyed whether the weather is warm or cold. 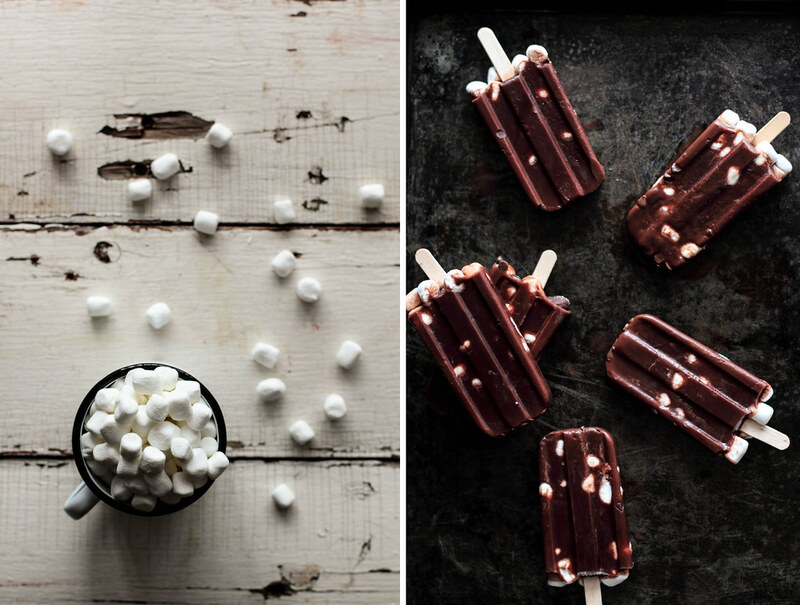 A rich hot cocoa is layered in a popsicle mold with mini chocolate chips and marshmallows. 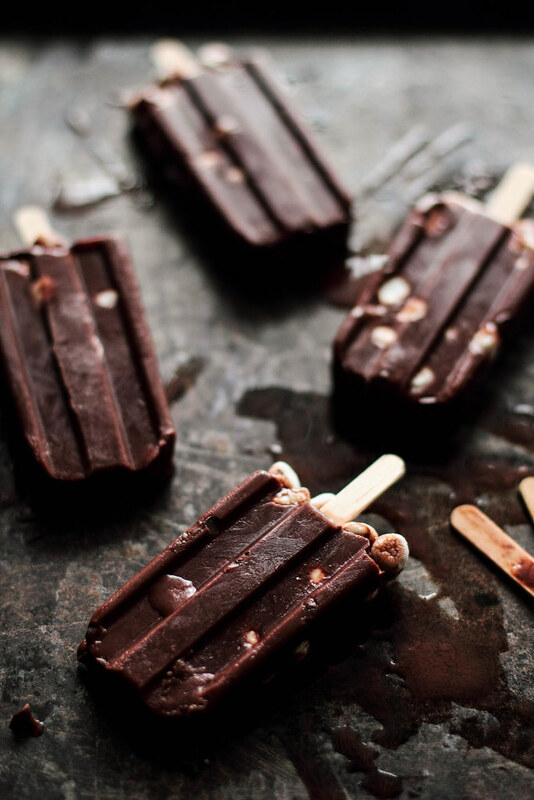 The popsicles are frozen in two parts to evenly spread out the mix-ins, which keeps all of the chocolate chips from sinking to the bottom and all of the marshmallows from rising to the top. 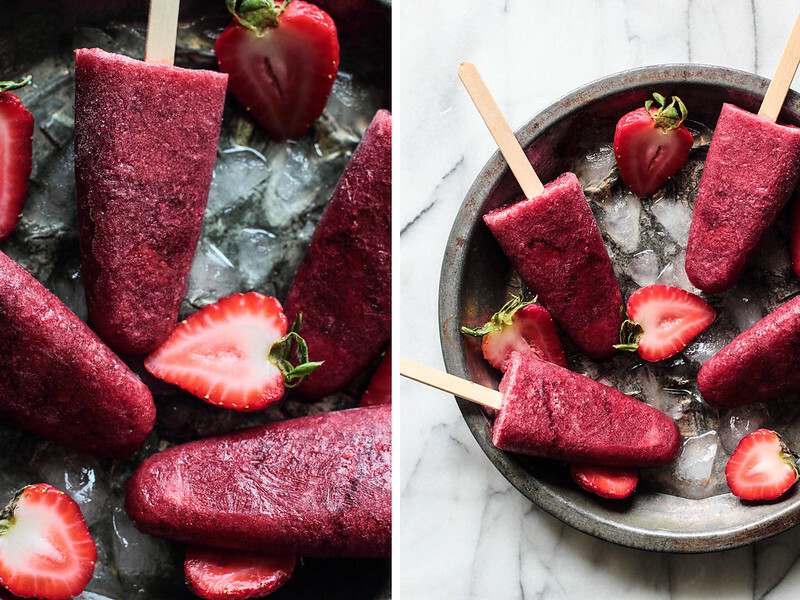 Once frozen, the popsicles can be enjoyed over the course of a couple weeks, reached for whenever a craving may strike.